Photo courtesy S.L. 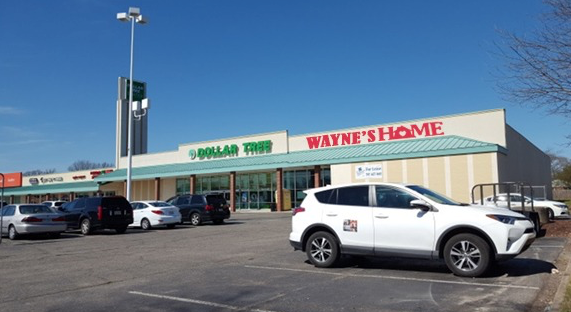 Nusbaum Realty Co.
Wayne’s Home, a home furnishing and electronics store, has leased 14,500 square feet of retail space at the Dollar Tree Center in Norfolk. The retailer’s new space is located at 2400-2420 E. Little Creek Road. This will be the second Norfolk location for the company, which opened its first store, Wayne’s Outlet, at 5650 E. Virginia Beach Boulevard in 2016. According to S.L. Nusbaum Realty Co., which announced the lease, the new location should be open by April. S.L. Nusbaum Realty Co.’s Seth Norman and Chris Devine represented Wayne’s Home in the transaction. Mike Zarpas, also with S.L. Nusbaum Realty Co., represented the landlord. Dollar Tree Center now is 100 percent leased. The shopping center is located between Norfolk Amphibious Base Little Creek and Naval Station Norfolk.